One of the more fun activities in bonsai is visiting bonsai displays in other locations. Cathy and I have followed the online newsletters published by the Redwood Empire Bonsai Society (REBS) in Santa Rosa, California for a number of years. The REBS is known for a number of things. 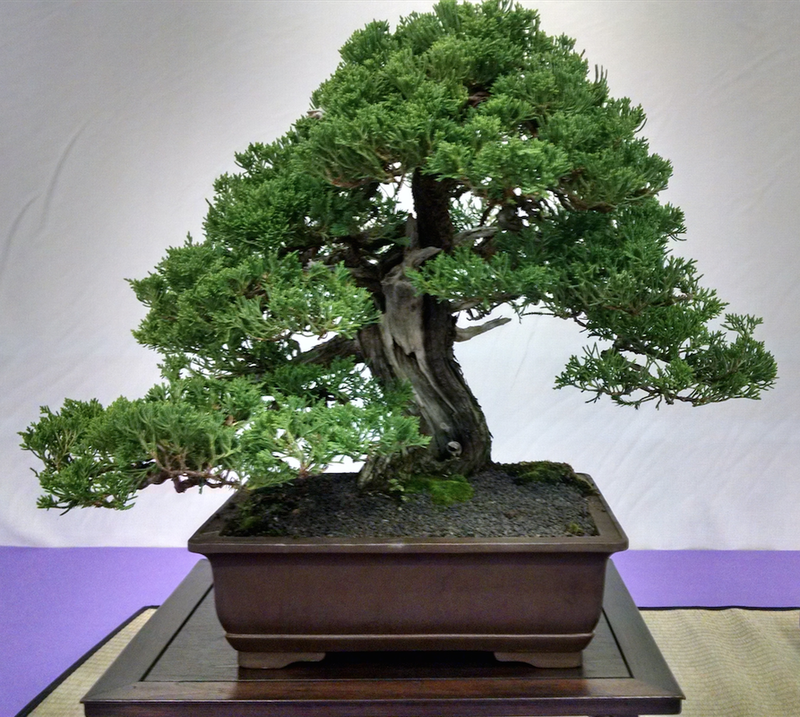 For example, Kathy Shaner is the club Sensei, but REBS is also very well-known for their August bonsai show which is one of the largest in the USA. Typically, the club shows more than 200 high quality bonsai trees. With this in mind, Cathy and I drove to Santa Rosa for the REBS show on August 23 and 24. It was a long drive, but the show is easily one of the best shows we have attended. Bob Shimon is the show chairman and he does an outstanding job organizing the show. Bob also sells redwood bonsai trees and Sara Rayner bonsai pots at all the bonsai shows. I spent a significant amount of time talking with Bob and buying bonsai pots (when Cathy wasn’t looking). 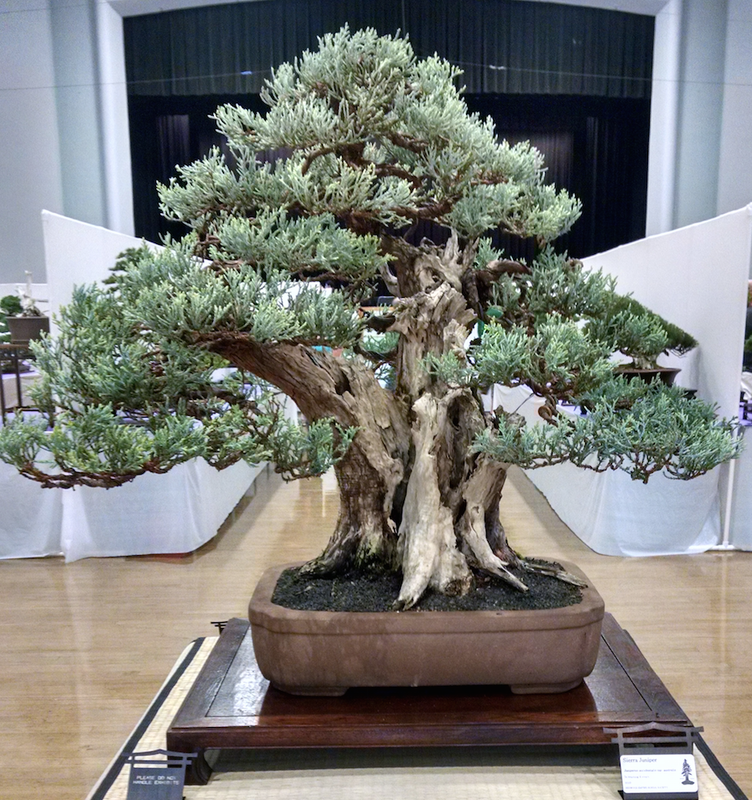 Bob had about 20 trees in the exhibit, the most impressive being the Sierra juniper in the entry way of the show. This tree was truly magnificent. Jim Gremel also had many trees in the exhibit. Jim, you may know, sells bonsai pots, high quality bonsai trees, and excellent copper wire at bonsai shows. Jim was kind enough to take Cathy and me around the exhibit for a tour of his trees. Jim is an entertaining guy and told us of the time many years ago when Fred Miyahara was visiting Jim’s house near Santa Rosa. During the visit, Jim remembered that Fred looked at a juniper that Jim was working on and suggested that grafting with shimpaku foliage would be the best course for the tree. Jim took this to heart and spent several years grafting this juniper (his success rate was somewhat low while learning to graft). The same tree was at the exhibit and now has mature shimpaku foliage. Another interesting tree was linked to John Naka. 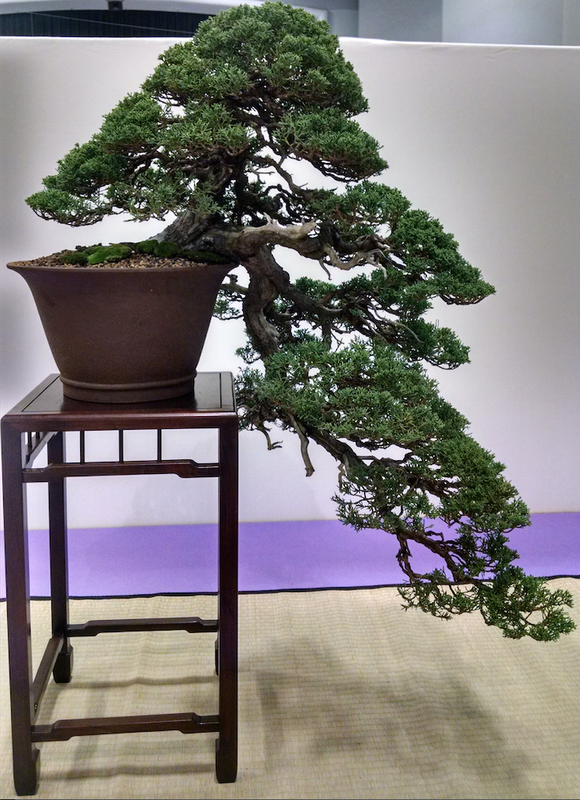 One of the REBS members purchased this juniper during a fundraiser at the Lake Merritt Bonsai Pavilion. 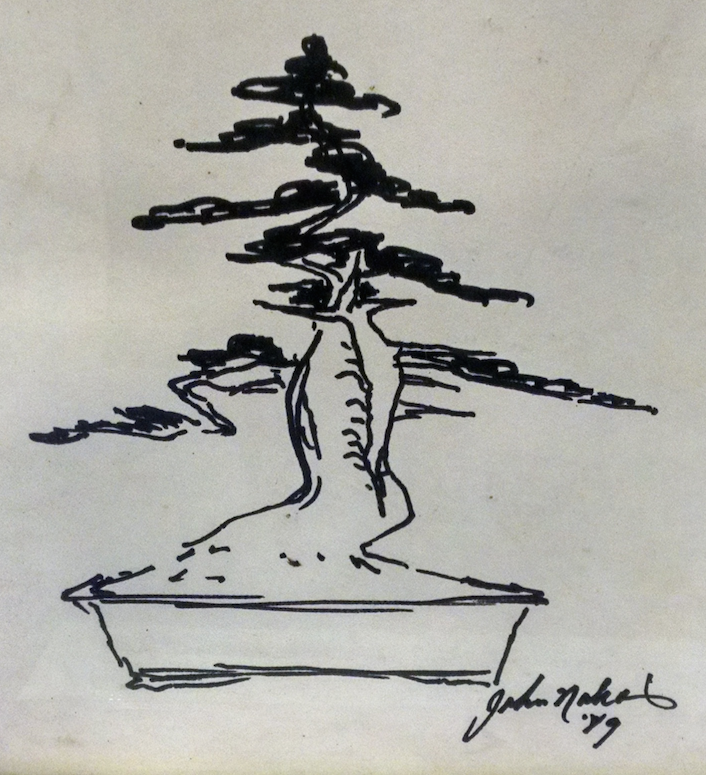 He subsequently found that the tree’s original owner worked on the tree with John Naka and John drew a picture of the tree in 1979. Shortly after purchasing the tree, the new owner made several design changes with Ryan Neal during a 2012 workshop. The tree and John Naka’s picture were on display at the exhibit. Other trees displayed included many redwoods, trident maples, boxwoods, blue atlas cedar cascades, grapes, and pines. This was truly a worthwhile show to attend.